To convey the image of a responsible power willing to contribute to regional stability and cooperation, China has shifted from a single-minded preference for bilateralism to an active participation in East Asian regionalism in the recent decades. This development has inspired discussions over whether a rising China could play a leadership role in building an institutionalized architecture for regional cooperation in East Asia. Nevertheless, this has not happened as East Asian regional cooperation and relevant activities remain mostly ad hoc and informal, especially when compared to regions such as Europe. To what extent has China contributed or constrained the development of regionalism in East Asia? What are China's desired roles and objectives in East Asian regional cooperation? What is the level of trust that other regional players have for China in regional cooperation? 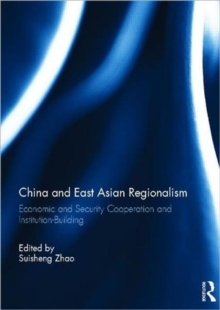 This book seeks answers to these questions by exploring China's motivations and strategic calculations as well as its policy practices in East Asian economic and security cooperation. This book was published as a special issue of the Journal of Contemporary China.